Far from a spoiler considering we don’t really know how Beverly gets into this situation. But it may be something of a recurring thing for the character since we’ve seen her be drenched with blood before. In It: Chapter 1, a younger Beverly Marsh, then played by Sophia Lillis, was hit with a geyser of blood when she looked down her bathroom sink drain. So it wouldn’t be surprising if an older Bev experiences that nightmare once again. 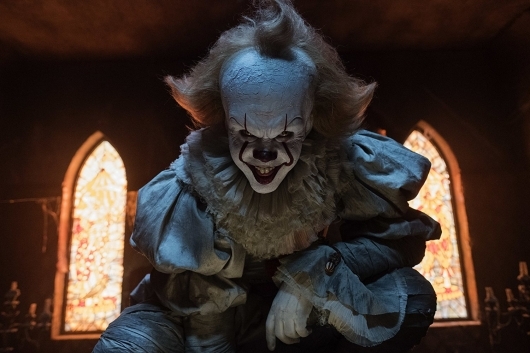 It: Chapter 2 stars James McAvoy, Jay Ryan, Jessica Chastain, Bill Hader, Isaiah Mustafa, James Ransone, and Andy Bean as older versions of members of The Losers Club, while Jaeden Lieberher, Sophia Lillis, Jeremy Ray Taylor, Finn Wolfhard, Chosen Jacobs, Jack Dylan Grazer, and Wyatt Oleff return from the first film as the younger Losers, respectively. Warner Bros. has scheduled It: Chapter 2 for a September 6, 2019 theatrical opening.